www.licindia.in - Life Insurance Corporation (LIC) of India is a leading insurance company providing insurance services since years. LIC of India has announced the new insurance policy recently. To know more about it, have a look at the information given below. Life Insurance Corporation declares “LIC Jeevan Lakshya” a combination of savings and safety. The plan has an advantage of annual income which helps to fulfill the requirements of family and especially for children. Moreover, there are several remarkable benefits of LIC Jeevan Lakshya policy. Minimum age to get policy is 18 years and maximum age is 50 years. Moreover, maximum maturity age is 65 years. The policy term will be 13 to 25 years. Premium paying term will be of 3 years. You can pay premium repeatedly at the time of premium paying term on yearly basis, quarterly, and on monthly interval basis. In addition, a grace period of one month not less than 30 days will be permitted for payment of yearly, half-yearly, or quarterly premiums and 15 days will be acceptable for monthly premiums. Additionally, if you don’t pay your premiums in the grace period, than your policy will lapse. You can revive your lapsed policy within a period of 2 successive years from the date of first unpaid premium. 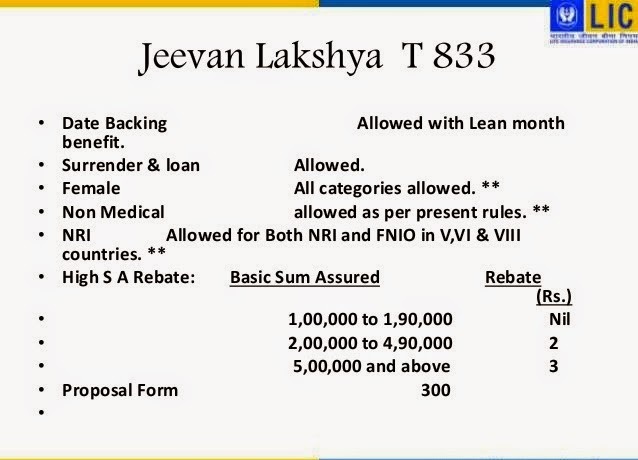 Check out below PPT Presentation for more details about Jeevan Lakshya Premium Payment Plan Table. Moreover, minimum basic sum assured is 10,000 Rs. and further in multiples of 10,000 Rs. In addition, the maximum basic sum assured is unlimited. 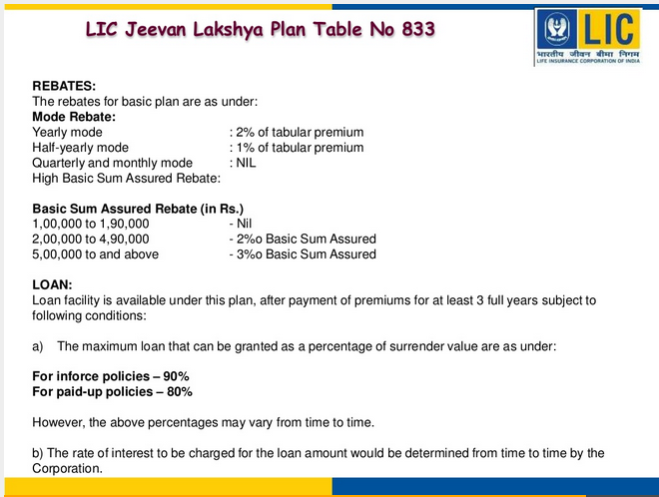 Furthermore, this LIC Jeevan Lakshya Policy has loan facility. You can get loan under the policy offered. The LIC Jeevan Lakshya Policy has benefits including sum assured on death and sum assured of maturity. In addition, you will get additional benefits like “LIC’s accidental death and disability benefit rider” and “LIC’s new term assurance rider. Furthermore, the taxes including service tax will be same according to tax laws and rate of tax from time to time. What are you waiting for? Opt to join the LIC Jeevan Lakshya policy today and get the advantages of the policy. If you have any questions regarding this policy than leave a comment below.